Tired Of Hitting The Gym Or Lifting Weights At Home And NEVER SEEING RESULTS? 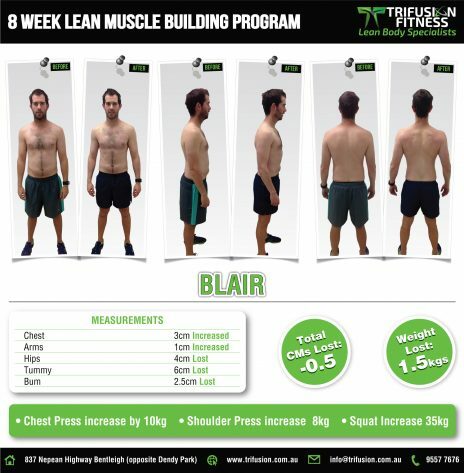 Trifusion Fitness is looking for 10 guys who….. Tends to focus all of their time and energy on work and family and have let their body suffer because of it. Wants to Learn the best Nutrition to be able to EAT MORE and STILL DROP FAT. How We GUARANTEE YOU RESULTS! You will receive the highest quality training with not 1 but ALL of our TRIFUSION FITNESS TRAINERS. We will not only show you how your body changes by taking your girth measurements, we will also show you how your fitness has improved by running you through our fitness assessment. 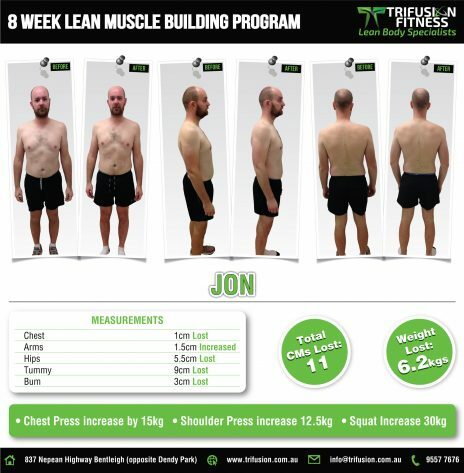 The Men’s Lean Muscle Program is aimed at increasing muscle size and strength whilst also dropping body fat to make sure we create muscular definition not just mass. All of this is achieved without sacrificing personal cardio fitness. 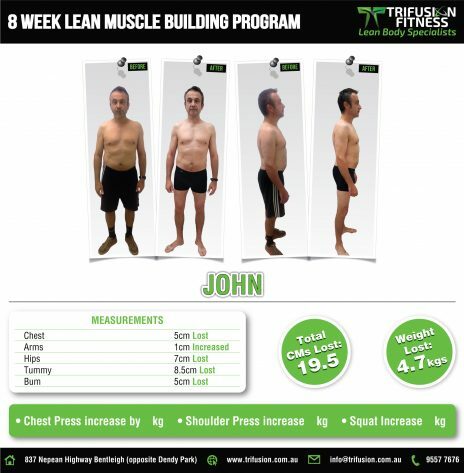 Each session has been meticulously designed by Professional Trifusion Fitness Trainers in order to maximize the time available in each session so that you leave with the maximum pump for each muscle group worked. 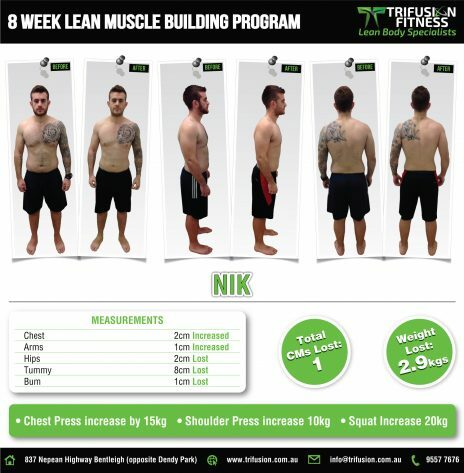 Our Specifically tailored program covers a break down of Hypertrophy and Strength Training. How to structure effective targeted resistance programs. The most effective muscle splits for a weeks training, how different sets and reps will produce different results. The importance nutrition plays in muscular growth and recovery. Most importantly, HOW and WHY we love this training so much, and in turn how to make each gym session enjoyable. The body you have doesn’t have to be the one you live with. If your not happy with your body this is the START you have been after. Limited Spots Available So Inquire Now. 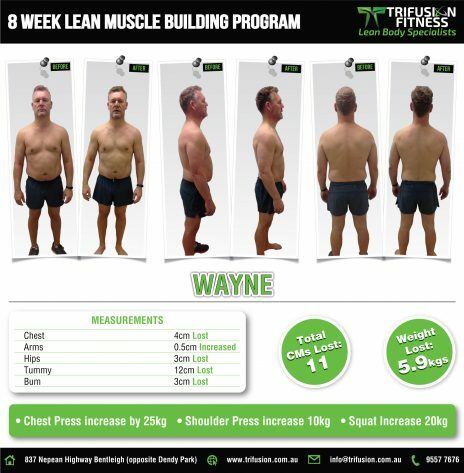 If your not 100% satisfied that we can help you to achieve a stronger leaner physique then just take a look at some of the testimonials. These are Real Bayside Fellas, No airbrushing, No Photoshop, just genuine RESULTS. Enquire Now Call (03) 9557 7676 Today! Enquire today and receive 5 delicious recipes to help you drop body fat and build lean muscle.